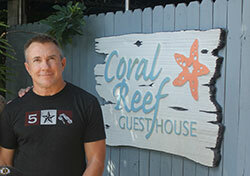 RW is the Owner of The Coral Reef Guesthouse since 2010. He loves the property and considers it an extention of his home and treats all guests as personal friends. He orginally came to Fort Lauderdale as a tourist, but after staying at The Coral Reef he made the move to Sunny Fort Lauderdale. Originally from Laguna Beach, RW brings his laid back California attitude with him everyday to work. You can find him here most days putting out breakfast every morning or chatting with Guests poolside.